You needn’t be an international banker, royal family member or Scarlett Johansson to want to keep your private files private. Basic digital security is something everyone should (do but few people actually do) practice. One easy step you can take: When you save your files to an external disk drive, especially one you are likely to travel around with, make it a biometric drive. 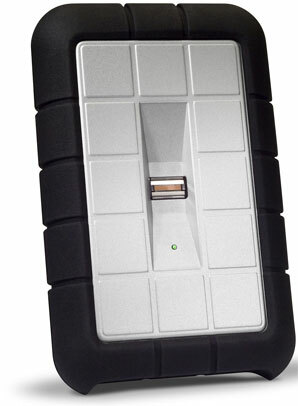 Like the LaCie Rugged All-Terrain Fingerprint-Secured External Hard Drive. For those familiar with LaCie’s regular Rugged All-Terrain hard drives, the fingerprint-secured model is nearly an identical product. It is about the same size (that of a short paperback book) and a touch heavier (10.5 ounces vs 8.8). 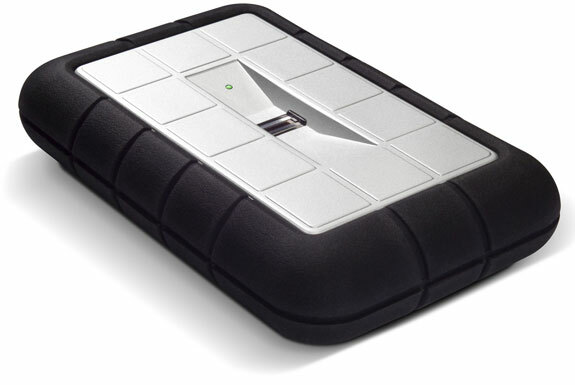 And it has the same protective rubber run-around that helps protect the drive when dropped or knocked against things. The major difference: the small fingerprint scanner that’s set within an indent on the top of the drive. The only way for some one to access the files on the drive is to swipe their finger across the top. Swipe an approved fingerprint—you can store up to 10 of them—and the drive “unlocks.” It’s all very James Bond. Setting up fingerprints is easy and the scanner really does work. After setting up ours Spot Cool Stuff did ten test swipes. Only once did the drive not unlock immediately. (On the aberrant scan the drive worked on the second attempt). Sadly, the drive does not support USB 3.0—only USB 2.0 and FireWire 800. We also found that our MacBook Pro wouldn’t always recognize the drive when we plugged it in; sometimes we had to unplug and try again. The other potential downside we found to the LaCie Rugged All-Terrain Fingerprint-Secured External Hard Drive the cost. 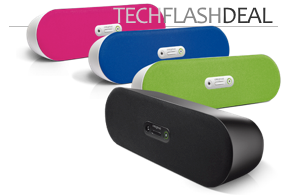 The fingerprint securing technology adds about a $40 premium to the price of a regular LaCie Rugged All-Terrain drive. Is that an expensive extra or a cheap bargain? It depends on whether or not you have a drive with private data that falls into the wrong hands.